To build a great company you’ll need to hire great people — it’s one of the top three priorities of the CEO. Executives have outsized influence on your company, and there is a slightly different process to hire them versus most employees. Today I’ll share my experience hiring executives to clarify my thinking, learn it one level deeper, and teach others (continuous learning is one of our values at Coinbase). These are the steps I like to follow. As you can see, it can take 3–6 months to hire an executive. Let’s dive into each section in more detail. When hiring an exec, it will likely be outside your area of expertise. You’ll first need to get a crash course in that role. What are the different types of finance leaders out there? Which is the right one for us at our stage? What are some good interview questions I should ask? What are some common terms/jargon I should be aware of when making this hire? What do you think are the must haves in this role vs the nice to haves? What is the best way to close these candidates? What matters most to them? At the end of the call it may be tempting to ask subject matter experts if they are interested in the role themselves (I’ve tried this a number of times, haven’t had it work yet!). But you probably aren’t ready for this yet since you don’t have the role defined yet. This will come in step 3. After your crash course, you’ll understand some of the basics, but you’ll still be far from an expert. That’s ok — keep going. Next you need to decide who will evaluate the candidates. You won’t usually decide on a new hire unilaterally, so you’ll need to gather input from various stakeholders. Aim for 4–7 people on the hiring committee. Enough people to get a range of input, but also not so many that you’re wasting people’s time (it will take 1–2 hours per candidate per member of the hiring committee, so it adds up quickly). A common mistake here is to decide what you want in a candidate first, and then later bring in the hiring committee to tell them what they should be looking for. In my experience, you need to genuinely gather their input, and incorporate it, to get them bought into the process (I’ll cover this more in the next step). It helps to get clear on what you want each member of the hiring committee to interview for. You may even want to assign specific competencies for them each to drill down into. It’s time to gather input from the hiring committee and reach consensus on what you’re all looking for. Competencies: What specific skills/experiences/accomplishments should they have? Which of these are must haves vs nice to haves? This should flow from the mission and outcomes. I like to first solicit input from the hiring committee on what outcomes and competencies we should be looking for. Then I consolidate everyone’s input into an initial draft of the MOC, and have the hiring committee meet in person to discuss the draft. Use this input to create your second and final draft. Make sure everyone feels heard, but look for consensus (you don’t have to include something if just one person thinks it is important). Gathering input from the hiring committee on which competencies are must haves vs nice to haves. If your company has a diversity and inclusion program, now is a good time to get clear on what sourcing targets you have as part of this search. Clearly articulate this as a must have or nice to have in the MOC. I typically choose the top three competencies as “must haves”. If you have more than this it can be difficult to find candidates which meet all of them. Now that you’ve completed the MOC document, the hiring committee should be in sync on what you’re all looking for. This is easier said than done — in almost every search I’ve done, there is a moment later in the search where the hiring committee has to come back to this document to review/update it, and get back in sync. Now that you know what you’re looking for, it’s time to get candidates in the pipeline. There are many ways to do this. In each case, use your MOC document to help people understand exactly what you’re looking for. This could be your investors, current employees, the subject matter experts you met in step one, social media, etc. This could be someone on your recruiting team or an external contractor who you can hire hourly to generate leads. These are firms that specialize in finding executives. If it is VP or C-level and speed is important, I’d recommend using an exec recruiting firm. Otherwise the first two options can work (and will be cheaper). Exec search firms can be expensive — budget roughly a third of the candidate’s annual compensation in cash + equity, or a flat fee of about $100k. In theory, they are helping you find great candidates faster, and when this works it can be well worth the cost. It doesn’t always work successfully. Most CEOs I know have a love/hate relationship with exec recruiting firms and have had a few bad experiences. I chalk this up to inexperience working with exec recruiting firms, and also that it is just like any service industry (the top people in the field are amazing, but you may not be able to discern who the top people are yet, and they may not be willing to work with you yet). The most important thing is probably chemistry and great communication between you and the partner you’ll be working with at the exec recruiting firm. You’ll need to build trust and rapport for the search to be a success. Meet with at least three exec search firms before selecting them, and really interview the partner you’ll be working with (not just the firm). Interview them like you’d interview any other employee you’ll be working with over the next year, since that may end up being how long it takes! Having an internal recruiter that can serve as a liaison between an exec recruiting firm and the company will improve communication and help keep the search on track. Are there at least three candidates in the pipeline this week that I’m excited about? If the answer is no, that is your clue to go back to the sourcing step and get more candidates in the top of the funnel. Keep going through this cycle until you close someone. Like making any hire, you’ll need to get the candidate excited about what you are building, and the idea of working with you. People join companies because of the mission and who they get to work with. They need to like you and want to work with you. Other factors like compensation come into play, but they are a lot farther down the list. This is to determine if there is potential for a match, before investing more time. Get to know them, and also give a quick sell of the company/mission. A video call (like Google Hangouts) can help build a connection with the candidate even faster. Ideally the candidate gets to visit your office, to get a sense of the culture and people. Every detail in your office, from the video screens in the lobby, to the wrapper someone left on the floor are making a first impression. Put your best foot forward. Next you’ll ask them to invest time completing in person interviews with 3–4 people on the hiring committee. If those go well, you’ll also ask them to give a presentation, followed by Q&A, to the hiring committee. It’s a good idea to have the candidate meet with several of your board members, since they’ll be working together as well. In the later stages of the process, a less formal setting can help to further build connection, as you work toward close. Psychologically, there is something good about going for a walk together — it puts people at ease, helps the conversation flow, and represents you both moving together toward a common destination together (as opposed to a face to face meeting in a small room where you are on opposite sides of the table). Throughout the process you’ll need to ensure the candidate forms a positive impression of you and the company. Steps 4, 5, and 6 sometimes blur together. You are doing a dance back and forth between finding candidates, convincing them to join, and evaluating them, at the same time. Evaluating first starts during step 4 (sourcing). I like to be quantitative about whether the sourced candidates are matching the MOC document (otherwise the discussion can feel too unstructured). For each of the must haves and nice to haves in the MOC, assign a 1 to 5 score. Then you can sort candidates by total points, and decide who to reach out to first (weight the must haves higher using the spreadsheet). See this sample spreadsheet. I like to start the weekly sync meeting for the search by reviewing this document. This will help you determine if your sourcing process (or exec search firm) is delivering candidates who are “on profile”, and next steps for each candidate. Once candidates start coming in to interview, use an applicant tracking system like Greenhouse to create scorecards that each interviewer fills out. This will help encourage the hiring committee to interview based on what you’ve agreed is important. It also starts to build a dataset that can be valuable over time (for example, you may not realize that someone at your company has already interviewed this candidate, or you can start to look at trends around unconscious bias). If the in person interviews go well, I like to have candidates give a presentation to the hiring committee as a next step. This provides a lot of signal about what it might be like to work with this person. Can they clearly convey information to a group of people? Can they avoid going over the allotted time, or getting flustered if something doesn’t work perfectly with their slides? Are they humble and open to alternative viewpoints in the Q&A? [10 minutes] Tell us about a challenging project you worked on. How did you work with the team (both up, down, and with peers) to make it a success? Teach us a counter-intuitive lesson learned during this project. What would you do differently if you had to do it over again? [5 minutes] How would you grow your team from 20 to 200 people? How would you change the org structure during that transition? How would you hire and retain the right people during this growth? [5 minutes] Share a bit about yourself, your strengths/weaknesses, and your passions in life. Help us get to know you personally. This is intentionally a lot of information to cover in half an hour. We like to see if candidates can reduce a lot of information down to the key points, and be concise (this is more specific to our culture). During this process, every member of the hiring committee starts by showing a thumbs up, sideways, or down (everyone at the same time), to indicate whether they are a yes, maybe, or no on hiring this candidate. You can then go around the room and share more detailed thoughts, starting with the most junior people first (to avoid group think). 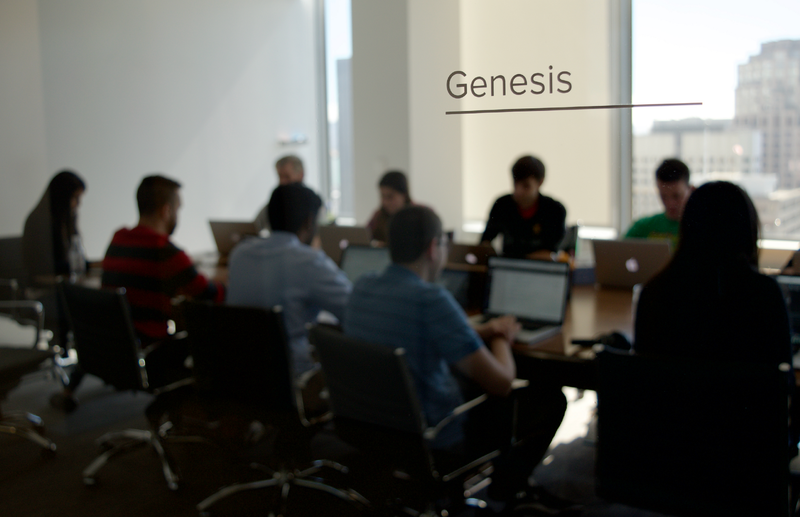 A hiring committee rounding up in Genesis — one of our conference rooms. There doesn’t have to be a unanimous yes, but there should be at least some people who are a hell yes, and ideally no hard nos, to move forward. A unanimous yes is required from the group above to make the hire (or put another way — any one of those three can veto the hire). If the roundup gets to a yes, you should now ensure that your reference checks are in place. You don’t need to wait until the roundup to start reference checks. In fact, you should probably start them right after the first in person meeting with a candidate (it will save you time the sooner you start since it may cut someone out of the process before you invest more time). An entire article could be written on reference checks alone, but I’ll summarize the key points here. You should ask the candidate for “front door” references (these can be helpful to better understand how to work with them), but they will usually be 100% positive. In my view, it’s far more important to get backchannel references. Under no circumstances should you skip backchannel references when hiring a senior candidate. You’ll need to look for people they’ve previously worked with, through your network, while being cautious not to create any issues with their current employer. This can be tricky, but it is worth the effort. For example, you can ask a trusted reference whether they would be willing to keep a call strictly confidential, before revealing a candidate’s name. It’s a good idea to ask for dates of employment to see if they match the candidate’s resume. Some candidates will remove work history from their resume when there was an issue — and these could be the most valuable references you find. A single negative backchannel reference is not a deal breaker, but you should be looking for recurring negative patterns. Ideal candidates find a way to maturely bring up and discuss prior work experiences that didn’t go well, without blame or criticism. Finally, you’ll want to do a criminal background check to ensure there is nothing you’re missing (this may only hit one in a hundred times, but is worth doing). If you’re not a hell yes, you’re a no. You should be raising the bar at your company with every hire you make. Ask whether this hire raises the average at your company. Or put another way, ask if this person is in the top 20% of people we could hire for this role right now (the italicized part is key, because you probably can’t get anyone you want for any role). You should feel genuinely excited to have this person start work on Monday. If you’re not excited, you’re a no. Hire for strengths against your MOC competencies, not absence of weaknesses. Hire based on your company values (this is what creates a strong culture), but also be open to (and seek out) people who are different than you. Especially for executives, imagine how you’d feel about this person hiring the next five people at your company without your input. Imagine how you’d feel about them representing the company externally, or giving a presentation to the whole company. If any of these make you uncomfortable, you’re a no. Is this person much better than you in at least one area? Did you learn something from them during the interview process? These are the hallmarks of a great candidate. Improving how you evaluate candidates is where you’ll really get your success rate up on hiring executives. If the hiring committee gets to a yes and the references check out, you’ll need to construct an offer for the candidate that is compelling. It’s a good idea to work with a compensation firm (such as Radford, Compensia, Connery, etc) or your investors who can provide market data. Otherwise you’ll just be guessing based off a few anecdotal data points. Construct the offer based on your leveling system, market data from the compensation firm, and your compensation policy (for example, you might target 75th percentile for equity, and 50th percentile for cash). Go for a walk with the candidate or schedule some time to discuss the offer by phone (in person is better). You’ll need to get good at explaining the value of the equity. Not all candidates understand how to value equity. It’s a good idea to use a table of outcomes. Be as transparent as you can (I think you should always disclose the total number of outstanding shares) but work with your legal team to ensure you don’t create any issues for the company while doing this. For example, you’ll need to create a disclaimer that more shares could be issued between when the offer was made and when the equity grant gets approved by the board. Some people like to bracket the compensation negotiation by coming in low. However, this can lead to unfair outcomes (some candidates are much better at negotiating than others) and it can start the relationship off on a sour note. So I prefer to simply come in with a good offer from the start based on the compensation data and philosophy that you have. This shows the candidate that you really are interested in them and differentiates you from competition. This builds trust and shows you value them. The people they’ve met during the interview process should continue to stay in touch with them via email, in person chats, etc. You may want to connect them with board members or investors to help sell the opportunity as well. Let them know this is a place where they are respected and have friends. It’s a lot of work to recruit great executives! Most of my exec searches have taken between 6–12 months, although I’ve seen others do it consistently in about 3 months (this is where I’d like to get to next). It’s a good idea to schedule a half hour weekly meeting while the search is ongoing, where you invite all relevant parties (the exec search firm, your in house recruiter, any investors who are helping refer candidates, etc). This will ensure the search keeps moving forward, and you don’t forget to follow up with anyone. Start this meeting by pulling up the sample sourcing spreadsheet shown in step 6 to get everyone in sync. Being afraid (consciously or unconsciously) to hire someone more senior than yourself. Beginning to source candidates before the role is clearly defined (the MOC document). Drafting the MOC yourself without getting input from the hiring committee. Voting yes on a candidate because you urgently need someone in the role, but you’re not truly excited about this particular person. Hiring executives too early — before you’ve really hit a period of growth. Hiring executives too late — after you’ve grown beyond your team’s current skillset (you’ll know you’re here when you’re consistently reacting to challenges, instead of getting ahead of them). Finally, when a new exec joins your organization, it’s a good idea to spend extra time with them during their first 30 days on the job. For example, if you normally meet with reports every two weeks, meet with your new hire several times a week for the first 30 days to ensure they successfully integrate into the organization. I hope this guide helps you improve your success rate hiring executives, and growing your company! Thank you to the following people for reviewing drafts of this post and teaching me about hiring: Adam White, Aurora Harshner, Barry Kwok, Barry Schuler, Bruce Wallace, Dan Romero, Jeff Stump, Jonathan Downey, Matt Levy, Matt Oberhardt, and Nathalie McGrath. If this sounds like an organization you’d like to be a part of, check out our open roles at Coinbase and GDAX. Thank you!